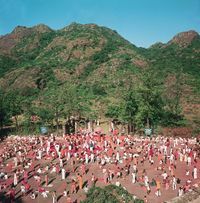 Meditation camps (Hindi: sadhana shivir) have been a feature of the sannyas landscape since 1964. Prior to that, Osho was lecturing, traveling and becoming well known as an electrifying speaker, but he saw that people were not being transformed, so he introduced camps, extended retreats where the focus was experiential rather than filling one's head with concepts. He would still speak at these retreats, often at length, but the event was not over when he stopped speaking. Then it was time to visit the interior landscape, to experiment with his techniques and use his words as signposts of things to look for, guidance regarding pitfalls and so on. Most of the day(s) would be spent in self-exploration, using a variety of ways to ask "Who am I?" Deeper and deeper. See also Talk:Osho: Call of the Ocean for a nice quote on why camps came about. 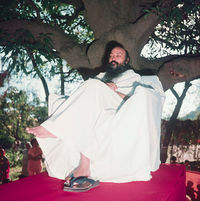 From the back cover of The Perfect Way, an English translation of his discourses at the first camp in 1964: "These discourses are the outcome of Shree Rajneesh's first testing of a new idea, the meditation camp, envisaging an intensive programme lasting several days, which enabled the seekers to dive totally into an atmosphere of meditation." As they evolved, camps were held several times a year in various formats, lasting a couple of days to as many as fourteen, and in "exotic" locations mainly around the northwestern states of India: seaside resorts, hill stations, usually but not always away from cities. Nargol, Matheran, Mt Abu and others became fabled places in the sannyas iconography. Traveling to such places came to an end in 1974 after Osho moved to Pune, but the camps did not end. 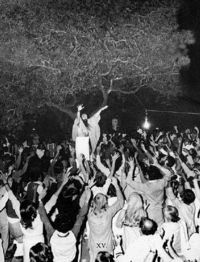 At Shree Rajneesh Ashram, it became possible to have these intensive retreats more often, though they were conducted by others who had imbibed them sufficiently to be able to lead them. But even with others nominally leading the meditations, Osho still came out daily to give discourse in the morning and darshan in the evening. The camps eventually settled into a somewhat standardized format, which ran more or less the same for the last five years of Pune One, and that was: 6-7 am, Dynamic; 8-9:30ish, Discourse; followed by Sufi Dancing, Vipassana, Nadabrahma and Kundalini and then an evening meditation which would be Gourishankar for one camp and Nataraj for the next, while Osho was giving darshan. The camps ran for ten days, from the 11th to the 20th of each month. For most of that time, both daily meditations and whole camps were led by Sw Christ Chaitanya. 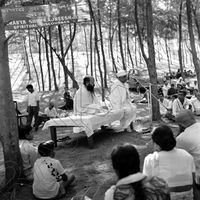 Camps also flourished in other places around the world but especially in India, even while Osho was still in the body. Osho's indefatigable roving ambassadors led hundreds of three-day, five-day and ten-day camps in all parts of India. Some of the best known leaders of those camps were/are Sw Anand Swabhav, Ma Yoga Neelam, Sw Narendra Bodhisatva, Sw Chaitanya Bharti, Ma Dharm Jyoti, Sw Anand Arun, Sw Chaitanya Keerti, Ma Amrit Mukti and Sw Satya Vedant. The easy availability of such opportunities to jump fully into Osho's meditation techniques made it easy for newcomers to get a feel for it, though they weren't only for newcomers. And so camps continue to this day around the planet, as focused retreats or also sprouting new forms such as 21-day Dynamics or Mystic Roses, intensives spread out over a longer period. A timeline of available info thus far is presented below regarding Osho's historic traveling Meditation Camps, from the days when he was based in Jabalpur and Mumbai. Info comes from here and there, two main sources being The Rebellious Enlightened Master Osho and Neeten's Osho Source Book. Links are provided where applicable and available for the books arising from camp discourses. A few other "special" / traveling events are included. More info will be coming, and see also Timeline (link on every page in the upper left sidebar) for a more detailed look at discourses, letters and events of Osho's public life. 1962 -- Jabalpur, Khandari Water Works No discourses were recorded. 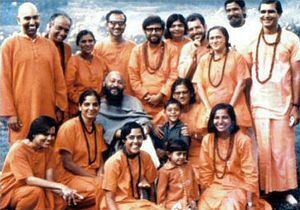 This was Osho's first camp-experiment, a sort of beta or proto-camp, with no lodging arrangements or travel to far-away places, but a focus on meditation rather than listening to words. Dec 12-14, 1964 -- Jabalpur MP not really a camp but an urban event, a "gyan satra," or "knowledge or wisdom session"
Jan 20-23, 1965 -- Mumbai another urban "gyan satra" / "knowledge / wisdom session"
See discussion re dates and discourse series, may actually be Dhyan Darshan (ध्यान दर्शन). Info is limited about this camp, talks for which may be entangled with those of several other books. Details at Girah Hamara's discussion page. Very little is known about this camp, which may have run more than the three days shown. More about that at Chikhaldara's discussion page. Details of place and time for this camp did not come whole but were pieced together inferentially. More about that at Peejiye's discussion page. Not a "standard" camp inasmuch as it was in the city, but otherwise, yes. Its seventh and final discourse is more or less missing, but its one-time existence appears solid. See Chit Chakmak's discussion page. Not a "standard" camp but a think-tank kind of event "to discuss how the color of peace may be spread far and wide in this vast ocean of life," possibly preparatory to a much larger gathering to organise the expansion of Osho's "work". The apparently five talks from Lonavala are not the only talks featured in Anant Ki Pukar but they set the theme. See also A Gathering of Friends, an independent translation of the first talk. This book aka a part of a four-volume series, Neti-Neti (नेति-नेति). Also it must be noted that other dates have been suggested for Satya Ki Khoj, Jan 16-19, 1970. Read all about it at Satya's discussion page. Some details uncertain about Prabhu Mandir, see its discussion page for more. Aug 3-5, 1969 -- Ludhiana PB Not a camp, thematically diverse talks to different groups in these three days. Unlikely that a single book or audio series resulted, ie perhaps (parts of) more than one, along the lines of Rajkot Mar 1970 below. Pahalgam, which Osho has often spoken of as Jesus' final resting place, is some 100 km from Srinagar, which Osho visited before the camp. Additionally, Osho spent several days in Pahalgam prior to the camp. 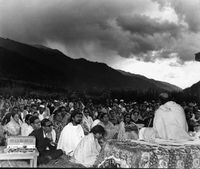 Thus, the precise date is not known of a talk where Osho addressed followers of Maharishi Mahesh Yogi, published as chapter 7 of Early Talks, but it was in Pahalgam around this time. That talk was the first time Osho spoke publicly at length in English, and also the first time to a Western audience. See also the discussion page for MMDM. This book aka a part of a four-volume series, Neti-Neti (नेति-नेति). Also note same dates as other series below. Seems that Shunya was given in the mornings and Naye Samaj in the evgs. Thus, this Rajkot event is likely not a camp, in the meditation retreat sense. See Shunya's discussion page for more. Not a "standard" camp format, ie retreat with committed meditators, but Dynamic was held in the morning on an open area with discourses in the evening on a larger open area. The evening talks were another four of the talks for Naye Samaj. 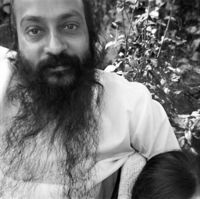 See Osho discourse given on 23 Aug 1970 pm for an account of those four evenings, including a disturbance created by Hindu chauvinist agitators. At this camp, according to one source, Osho created a new mode of taking sannyas. See "Sadhu" and "Sadhvi" for details and sources. Osho also introduced Mulla Nasruddin stories in this camp. This was not a "typical" camp in that it was urban and talks were given only in the mornings. It is not known how much of the rest of the day was given to meditation practices, but evenings were given over to another discourse series. The full Dhyan Ke Kamal series was not completed until the tenth talk in Jan 1973. This and the two previous camps were the first camps in which Osho gave a whole series of discourses in English. In fact, he spoke in both Hindi and English on these occasions, the English portions comprising That Art Thou and the Hindi the Upanishads, which were later translated into further English books. See That Art Thou for details. See also Osho News: A short story narrated to Anuragi by Vishnu who, as a 23-year-old, met Osho in Mt. Abu where he took three photographs.